Banking innovation. Allied Irish Bank (AIB) opens The Lab, their first digital banking store, offers free use of iPads, iMac & wifi, and a unique banking experience. 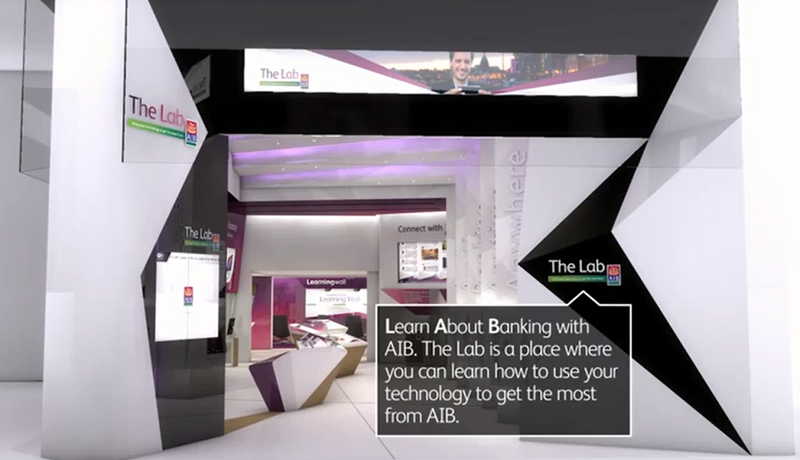 Earlier today, AIB Bank announced on social media (facebook and twitter) the launch of their brand new branch of the future, The Lab. The grand opening to the public will take place tomorrow. More information on The Lab is also available on social media: AIB’s youtube channel (10 videos via this playlist) and The Lab’s own facebook and twitter (@TheLabAIB) accounts. Please find below a description from The Lab’s official facebook page. We would like to introduce The Lab, a new store from AIB, the first of its kind in Ireland. Its learning and research environment focussing on helping you get the most from our current and future banking services. The Lab will bring all of AIBs leading edge technologies together in a physical hub to showcase, test and introduce you to the best digital banking experience in Ireland. 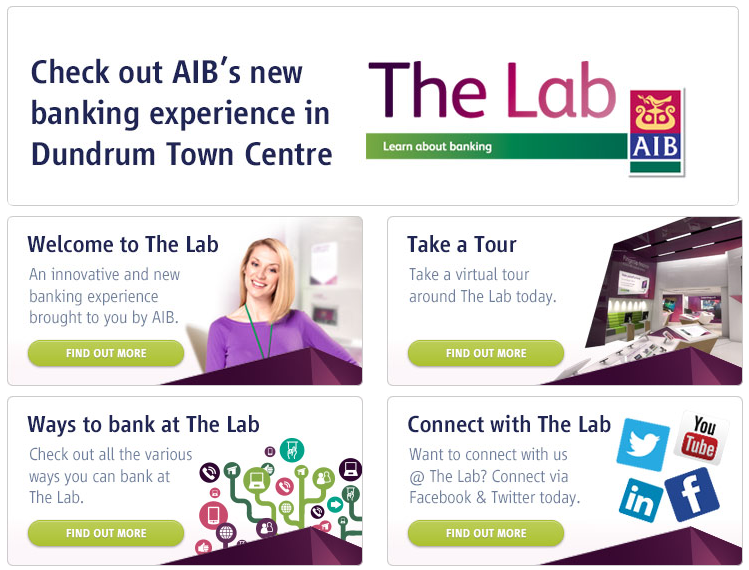 The Lab is situated in Level 1, Dundrum Town Centre and is for both AIB and non AIB customers. It is focused on providing a friendly and supportive environment for visitors to learn about AIBs different self- service banking offerings and forthcoming services and product launches. The Lab stands for Learn about Banking so when you visit the store, you can experiment with your own technology or AIBs technology which is available in store to use and experience. As well as having access to AIB products, visitors will have free use of iPads, iMacs and wireless Internet, as well as an unique banking experience that is not something that will be experienced elsewhere. You chose now how you wish to interact with AIB, the way that suits you best. Bernard Byrne – Director of Personal, Business and Corporate Banking at AIB: “Almost half our customers have yet to embrace digital banking. 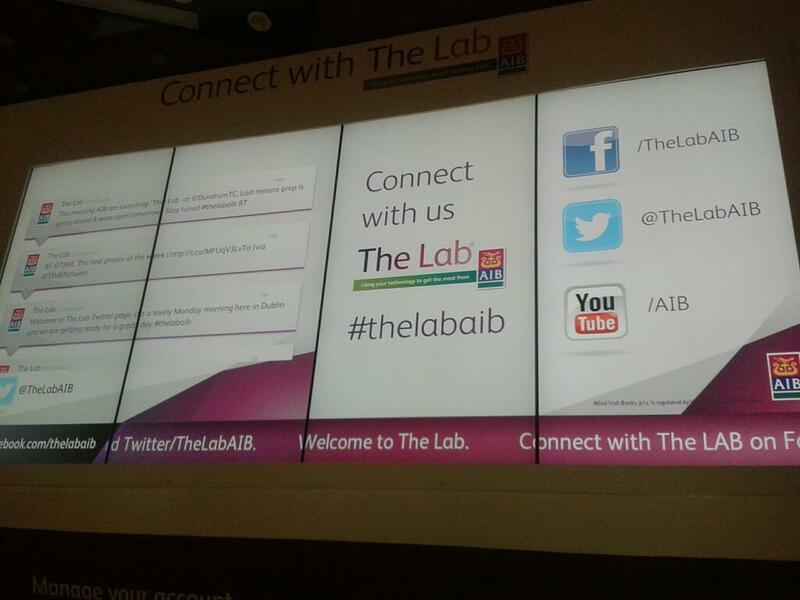 The Lab also includes a social media wall displaying a twitter feed tagged with the following hashtag: #thelabaib. Photo credit: Alan Cronin – Online Marketing & Social Media Implementation Manager. It is always a pleasure to see new banking innovations aiming to connect with banking customers and bridge the gap between digital and the real world. What do you think? I invite you to share your initial thoughts on The Lab by AIB, and tell us how innovative you find this initiative, here or on twitter.